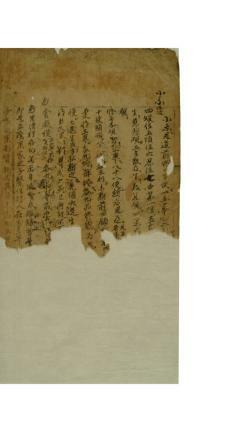 중국 당나라 법장이 마명(馬鳴)이 지었다는『대승기신론(大乘起信論)』에 대해 주석한 교장의 일종으로 조선시대 1457년에 금속활자(초주갑인자)로 간인한 불서 3권 1책이다. 본래 『대승기신론』은 마명의 저작으로 전해지고 있으나, 중국에서 찬술한 위경이란 주장도 있다. 이『기신론』은 서분, 정종분, 유통분으로 구성되어 있는데, 정종분(正宗分)은 그 아래에 인연분(因綠分), 입의분(立義分), 해석분(解釋分), 수행선심분(修行善心分), 권수이익분(勸修利益分)으로 편성되어 있다. 이러한『기신론』은 이론과 실천의 양면에서 대승불교의 중심적인 사상을 요약한 것으로서 단편에 불과 하지만 불교학에 있어서 매우 중요한 문헌으로 평가되고 있다. 그래서 일찍이 법장의「소」와 원효(元曉)·혜원(慧遠)이 각각 「소」를 부친 것을 ‘기신론삼소’라 하여 널리 알려져 있다. 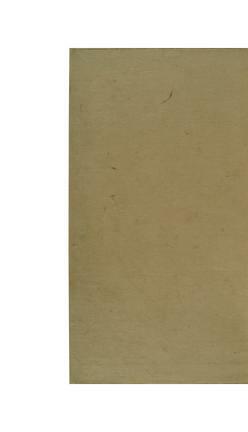 법장의 「소」는 원효의 주석서인『기신론소』에 영향을 받아 저술한 것으로 알려져 있다. 그러나 법장의「의기(義記)」와는 내용과 편장이 약간 다르다. 이『대승기신론소』는 대각국사 의천의『교장총록』에 법장이 찬자로 되어 있는 것은 ‘소 3권’으로 기재되어 있다. 우리나라에서는 현재까지 유일하게 전래되고 있는 책으로 알려져 있는데, 이 책은 권수제 다음 행에 ‘서대원사사문 법장 술(西大原寺沙門 法藏 述)'이란 저자표시가 기입되어 있으며, 그 아래에 주해자인 종밀(宗密)의 이름이 보이고 있다. 이 책은 권상지이(卷上之二), 권하지일(卷下之一), 권하지이(卷下之二) 등 3권 1책이다. 권상지일(卷上之一) 은 결본상태이어서 아쉽다. 권말에는 세조가 죽은 아들을 위해 1457년에 지은 어제발문이 수록되어 있다. 이 책은 본래 원효의 주석서인『기신론소』에 영향을 받아 저술한 것으로 알려져 있는 법장의 「소」에 종밀이 주해를 가한 주석서로서 조선 세종 연간에 초주갑인자로 간행된 교학 불서이다. 일본에서는 수차례 간행되어 널리 유통되고 있으나, 우리나라에서는 현재까지 이 책이 유일한 원간본으로 알려져 있다. 비록 약간의 상권의 일부가 결실되어 유감스러우나, 국내 유일의 원간본이라는 점에서 불교학 및 조선 초기 고활자본 연구에 귀중한 자료가 된다. 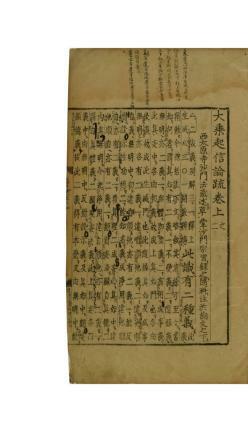 Commentary on the Mahayana sraddhotpada Sastra (Awakening of Faith in the Mahayana) is a critical and annotated edition of Mahayana sraddhotpada Sastra, a work of the Indian monk Acvaghosha according to Fazang, its author who was a Tang-dynasty monk. 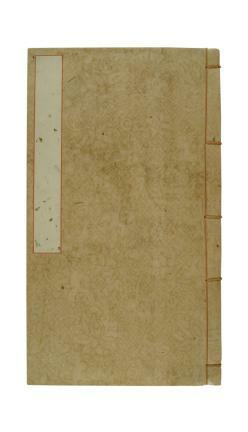 This three-volume version published in Joseon, in 1457 was printed with a movable metal type (1st cast gabin type). 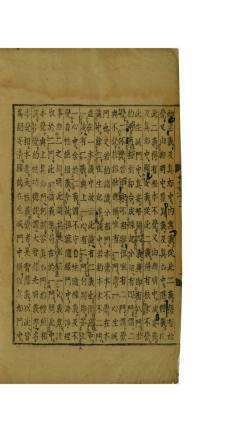 Although attributed to Maming, Mahayana sraddhotpada Sastra is an apocryphal text, written in China, according to some. 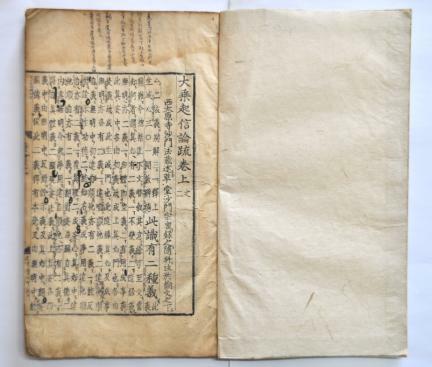 Although relatively short, Mahayana sraddhotpada Sastra is considered an essential text in Buddhist research, as it summarizes central ideas of Mahayana Buddhism. This is also why this commentary by Fazang was widely known along with those by Wonhyo and Hyewon, under the designation of Gisinnon samso (Three Commentaries on the Awakening of Faith in the Mahayana). 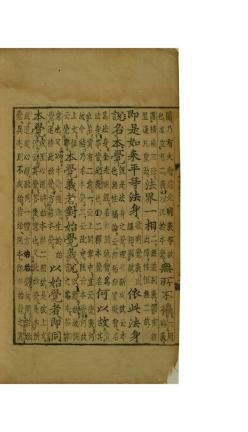 Fazang’s commentary is said to have been written under the influence of Gisinnonso (Commentary on the Awakening)’ by Wonhyo. 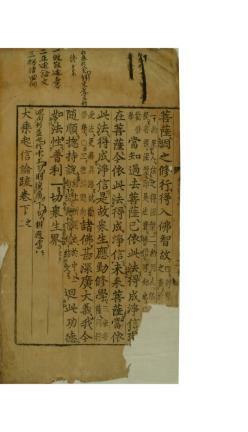 The commentary by Fazang, however, is slightly different in content and organization from his Uigi (Annotated Commentary on the Awakening of Faith in the Mahayana).As the sole surviving copy in Korea, this copy provides authorship information under the title of the volume. 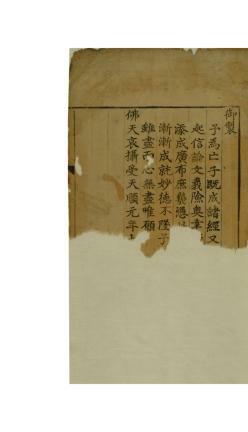 The commentator and annotator are identified respectively as Fazang and Zhongmi. 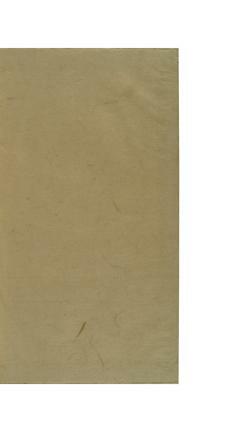 Some parts of the first of the three volumes making up this book are unfortunately missing. 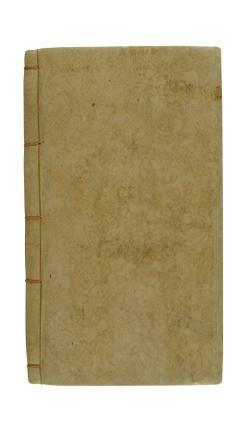 There is a postscript, at the tail of the book, written by King Sejo, in 1457 containing memories and prayers for his dead son. 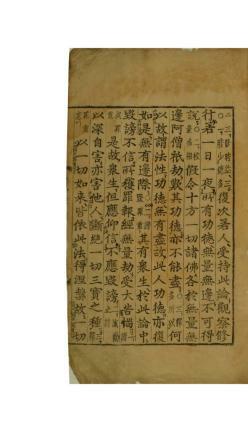 While this book was re-published in Japan, several times over the centuries, and was widely circulated, in Korea, this is the only extant copy of the first edition of the same text. 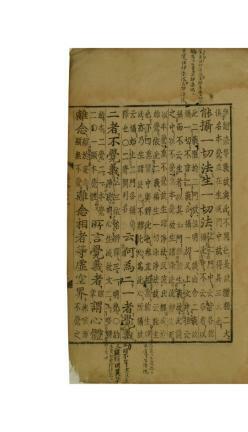 Despite the fact that some parts of the first volume are missing, this sole surviving copy of the first edition of this book is invaluable for Buddhist research as well as for research into movable type printed books of early Joseon.